It is not a coincidence that La Paz means “peace” in Spanish. Many tourists who drive the 1,000 miles from Tijuana on the Baja Peninsula and they get they reward: to La Paz are rewarded with a peaceful city and blissful weather. 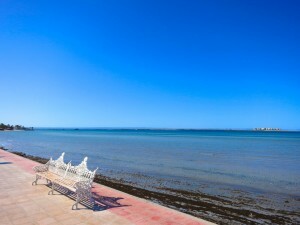 With only 220,000 inhabitants, and being the region’s commercial and political center capital of the state of Baja California Sur, La Paz is remains a tranquil, easy-to-love port. It has preserved with a nostalgic and provincial atmosphere that makes you think that little has changed here for decades. Even though Herman Cortes visited La Paz back in 1535, this inhospitable land was barely populated until the 19th century. A Jesuit mission settlement built in 1720 was abandoned 30 years later, having endured Indian revolts, disease and Baja’s harsh environment. There was no permanent settlement here until 1811. In 1829 La Paz became California’s capital after Loreto was leveled by a hurricane. A strong pearl diving industry kept La Paz going until the 1930s when the oyster beds were destroyed by disease. La Paz languished until the trans-peninsular highway was completed in 1973 and the city became capital of the newly formed State of Baja California Sur in 1974. Until the early 1970s, Baja California Sur had a population density of less than one inhabitant per square kilometer! Things haven’t changed radically, so you’ll find plenty of crowd-free spaces and isolated beaches. 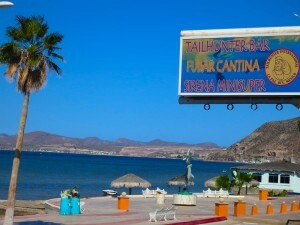 With the opening of the 1,680-km (1,044-mile) trans-peninsular highway, and the establishment of the peninsula’s southern region as Mexico’s newest state, La Paz began to attract not only adventurers, but also folks looking for a friendly and laidback holiday. If you prefer not to drive, no problem as direct international flights to Los Cabos and La Paz makes getting there a breeze. As well, Baja ferries run from La Paz to Mazatlan and Topolobampo. The opening of several resort hotels and an assortment of fun-in-the-sun amenities from golf courses and fine restaurants, to museums and restored colonial-era buildings provide tourists with plenty of choices once they arrive. Surrounded by barren desert, La Paz is set amidst ancient laurel trees and coconut and date palms. The city is laid out in classic grid fashion with streets radiating from the city’s northwest facing waterfront (Paseo Alvaro Obregon). Running parallel to Paseo Obregon is the city’s lovely malecon (waterfront promenade). A few blocks inland is the main square with its pink quartz gazebo, tiled walkways and 19th century cathedral. El Mogote, a flat deserted sandbar, sits offshore. The city has some nice beaches, but only a few miles away, you’ll know heaven is a place on earth the beaches are superb. La Paz is not a massive beach resort, so, if you’re one of those people who you hate those 5000-room mega hotels; this is the place for you. La Paz sits on the Sea of Cortez that famous French oceanographer Jacques Cousteau dubbed “the aquarium of the world.” Bountiful flora and fauna make this one of the world’s top places for diving. Fishermen were surprised in early 90s when tourists arrived to hire them not to kill the marine life, but to observe and photograph whales whose feeding grounds have been here for centuries. Of course it was a new business opportunity. Today, whale watching is an expanding eco-friendly industry that is helping many low-income families to benefit from regional development. Within easy reach of the city are deserted beaches, calm bays and pristine offshore islands. Further inland lie deserts, oases and the Sierra de La Laguna Mountains. The unspoiled natural environment brings sport fishermen, divers, eco-tourists, naturalists, whale watchers and travelers of all ages to this exquisitely peaceful corner of Mexico.